Health worker Mary Ikiring listens as 26-year-old Susan Adongo describes the health problems she's been experiencing. Susan assumes she has malaria. Photo courtesy of Irene Mirembe. Susan Adongo, a 26-year-old stay-at-home mum, has not been feeling well for the past few days. As she runs her daily errands, she feels a slight backache, fatigue, and headache. Today she has traveled over three kilometers to Kyere Health III to see a health worker about what is afflicting her. “I know for sure this is malaria,” Susan says. 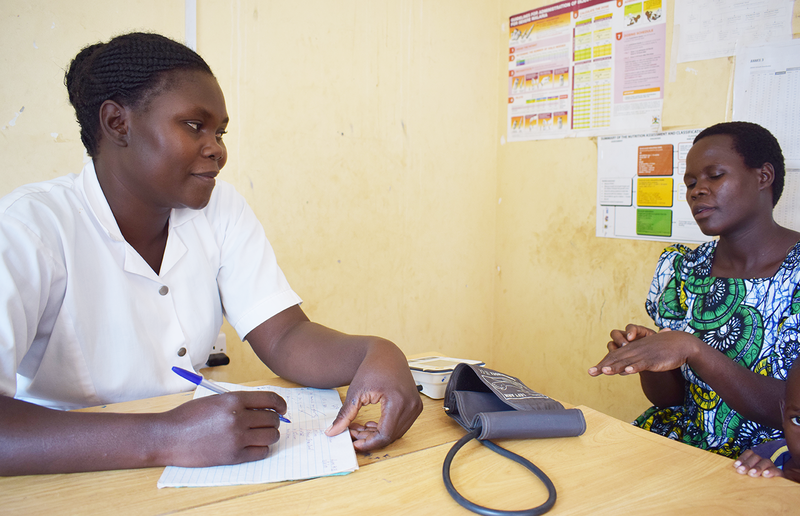 “The village health team has always mentioned to us the symptoms of malaria during the health talk sessions and this is exactly what I am experiencing.” She just wants to get the malaria treatment drugs, commonly known as ACTs, and go home. Some clients receive malaria drugs without ever having a proper diagnostic test. She and her two-and-a-half-year-old son wait patiently with other mothers and their little ones in the waiting area. Kyere is a public health facility in Uganda’s Serere district, one of the 25 districts with which the IntraHealth International-led USAID Regional Health Integration to Enhance Services in Eastern Uganda (USAID RHITES-E) works to deliver high-quality services to communities like Susan’s. Recent reports from Kyere Health II indicate high rates of positive malaria tests—much higher than the national average of 7%. Last December, it reported a positivity rate of 12%. This rings an alarm: a rate this high usually means officials need to take a closer look into how the facility manages suspected malaria cases. The line of clients moves fast and Susan soon meets with a health worker. Mary Ikiring welcomes Susan into the counseling room and listens as she describes the problem. Mary asks questions about the symptoms as she takes notes. Then she sends Susan to the laboratory to have her blood drawn. This has been the trend: clients walk in and state that they have malaria, and straightaway a clinical diagnosis is written out. The clients receive malaria drugs and walk out without ever having a proper diagnostic test, often because the health worker is alone on duty or inundated with too many clients. But treating clients for malaria without testing them affects the overall malaria positivity rate, since each of these cases is recorded by the health worker as a malaria case. It also means that many clients leave with medications that won’t treat the conditions that are actually ailing them. Knowledge gaps on the part of health workers about Uganda's new test, treat, and track policy, and false impressions like Susan's that every fever is malaria—both of these affect overall health outcomes in the region. The Kyere Health Facility II reduced its malaria positivity rate from 12% to 7.5%. Susan meets the laboratory clinician, who conducts a rapid diagnostic test that will determine if she is suffering from malaria. After 15 minutes, the test comes back negative. Susan does not have malaria, but it turns out she does have a urinary tract infection. So the health worker sends Susan along with her results slip and proper diagnosis to pick up the right medicines from the health facility dispensary. The government of Uganda launched a test, treat, and track policy in 2016 to address inaccurately high malaria positivity rates. Now USAID RHITES-E has implemented the policy through trainings, mentorships, and district meetings, and this has brought changes that are bearing fruit. As of February 2018, the Kyere Health Facility II reduced the malaria positivity rate from 12% to 7.5%, only slightly above the national level. The goal is to further reduce it. Collaborating with IntraHealth’s USAID RHITES-E, the district trained all its health workers and provided on-site mentorship and supervision to emphasize the need to test clients for malaria before prescribing treatments. The district also established rewards to motivate staff and measures to hold them accountable for any misused malaria drugs. “At the district, we worked with USAID RHITES-E to roll out the new policy in all the health facilities right from health center IIs,” says Dr. Francis Odeke, the district health officer, Serere district. The new test, treat, and track guidelines have not only reduced the malaria positivity rate, they have also ensured that malaria is properly diagnosed and treated to completion, leading to better health outcomes for people like Susan. This is the change USAID RHITES-E is now carrying forward to other districts, improving their malaria practices and helping them adopt best practices that save resources, strengthen health systems, and improve the health of those who live along the last mile for health care delivery. The IntraHealth-led Regional Health Integration to Enhance Services in Eastern Uganda (USAID RHITES-E) is funded by the US Agency for International Development.